'Secret Weapons' is home to Valiant's super team of misfit heroes. It's made of psiots that were rejected by Harbinger Foundation for having...unconventional powers that were deemed useless. Owen Cho's gift is the ability to conjure up anything out of thin air. Unfortunately, what Owen conjures up is totally random leading to some awkward moments. This latest standalone examines his origin story. With a talent like Owen's, you're bound to collect an eclectic number of things that seemingly have little value. The natural thing to do, as most of us would, is to hold a garage sale. That's how the story opens with Owen presiding over the sale of his stuff, a plethora of household goods. It's a clever and amusing starting point before delving into his backstory. He seeks the advice of a tarot card reader and as he consults with her we relive his arrival at the Harbinger Foundation throughout his training, meeting his fellow misfit psiots and ultimately the demise of the Foundation altogether. What's most interesting is the parallel between the trainer at the Foundation and the tarot card reader that insist that Owen needs to concentrate better. Poor Owen does nothing but concentrate and still, he conjures up the most random things instead of what he needs at any given moment. The problem persists but this is really about getting to know Owen for the kind of person he is. He's a good guy who wants to help and do his part but is undermined by his unreliable power. Raul Allen's line work is always great and the layouts are mostly 8-10 panels a page which bring to mind David Aja's incredible run on Marvel's 'Hawkeye.' It creates a more compact storytelling device that tries to fill as much story as possible in one issue. This helps new readers to catch up on the overall storyline but might feel like a retread for established ones. Patricia Martin keeps it simple but effective with a limited 3-4 color palette, permeating the pages with subtle blues and purples. 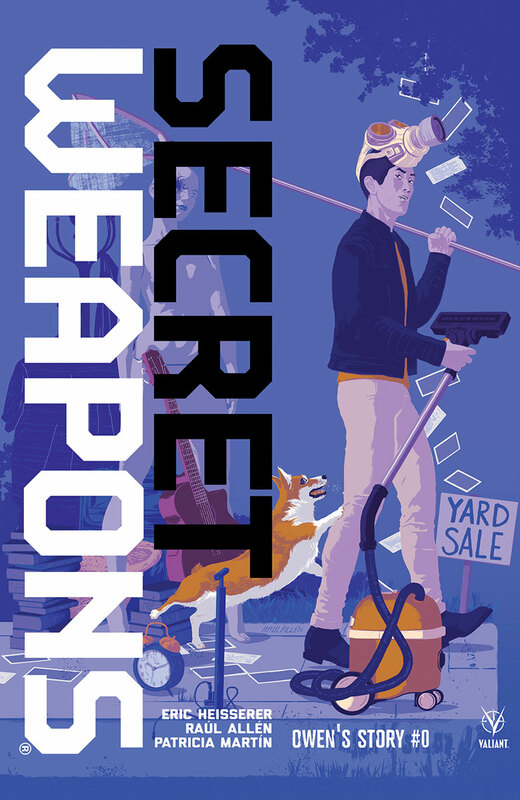 'Secret Weapons: Owen's Story' #0 is a neat offshoot, endearing and charming, that captures Owen's dilemma and history in one volume. It's all well told and beautifully illustrated but I wonder if it's enough to attract readers outside of existing fans. Would I recommend it? Yes. It could be a gateway for new readers and I suppose that's what a zero issue is supposed to do.